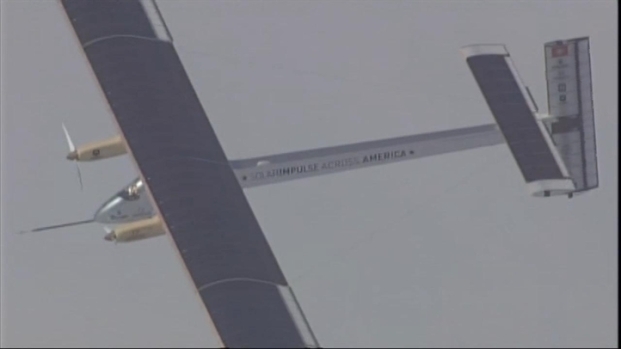 The Solar Impulse airplane landed in Phoenix early Saturday morning after flight that started at Moffett Field. The solar powered plane set down about 12:30 a.m. at Sky Harbor Airport after flying several hours after sundown to complete the first leg of a planned cross-country trip that its co-pilot described as a "milestone" in aviation history. The Solar Impulse — considered the world's most-advanced sun-powered plane — left Mountain View just after dawn Friday. Its creators said the trip is the first attempt by a solar airplane capable of flying day and night without fuel to fly across America. It's the plane's first cross-country tour, bound for New York as its final destination. One pilot is making a very slow 16-hour tour of the Bay Area Tuesday on board a plane that is run on the power of the sun. Considered the world's most advanced sun-powered plane, which only travels about 30 or 40 mph. The point of the powering a plane with 12,000 photovoltaic cells, all powered by the sun, is to show the world that it can be done, and to inspire engineers to look for advances in clean tech. "We're here to inspire," Swiss creator André Borschberg told NBC Bay Area before an earlier flight, adding that that he hoped this science and technology - and imagination - would trickle down to the "younger generation." 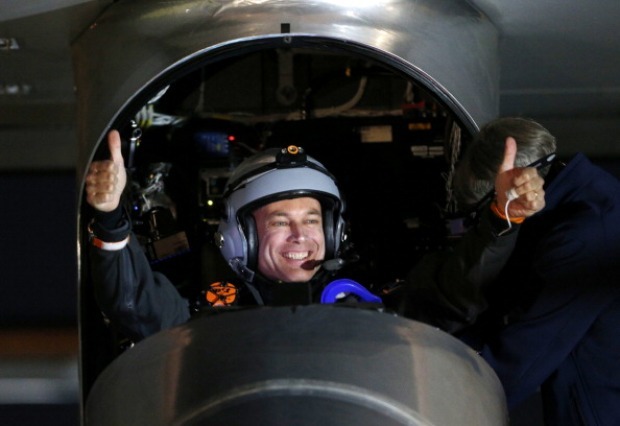 Pilot Bertrand Piccard posted a photo on his Twitter page during the flight. The plane has the wing span of a 747, but the weight of the mid-sized car. It can only carry one passenger who has to stay awake through the entire flight. On the longer flights, the pilot is allowed to take naps eight minutes at a time. There is no auto-pilot. The cockpit seat is the only seat in the plane, but it has a dual purpose and it equipped with a toilet. The Solar Impulse was designed to show the potential of solar power. Its creators say it will never replace commercial flights. The plane reaches a top speed of 43 mph and holds the record for altitude for solar-powered planes at 30,300 feet, according to the company's website. The Solar Impulse will first stop in Phoenix, and then head to Dallas, St. Louis, Washington, D.C., and New York. Each flight leg will take 20 to 25 hours, with 10-day stops planned in each city.